When you first see the pic, just look at the entire photo and, if you are like me you will see almost all the plates turned upside down. 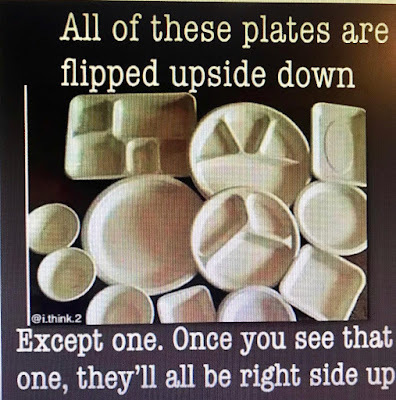 Then, as it says in the instruction, look on the left side to the one plate that is obviously right side up....after you look at it, then look at all the other plates and they all seem to be right side up. How is that possible? Are you one of the ones that saw them all right side up from the beginning, or are you like me and many people that did see the plates upside down, but upon seeing one of the plates right side up, all the other ones immediately looked like they were right side up all the time and it makes you wonder how you saw them upside down in the first place. It is an amazing optical illusion to me.